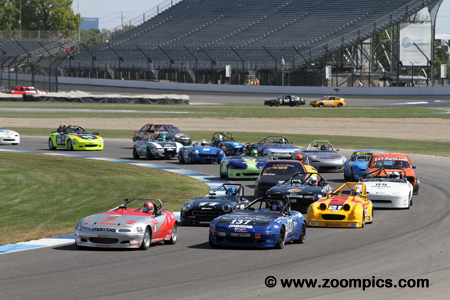 In 2014, the Sports Car Club of America decided to move the premier event � The Runoffs � to a new venue each year. Prior to this, the club signed multi-year contracts with racetracks to host the annual event. 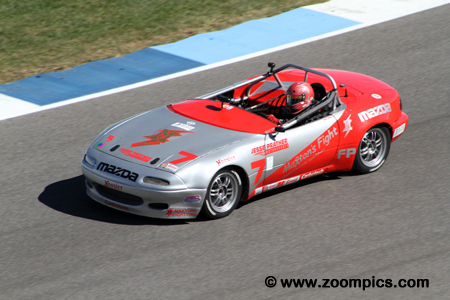 In the first year of this new concept, the National Championships were held at Mazda Raceway Laguna Seca which was followed by Daytona International Speedway and then the Mid-Ohio Sports Car Course. 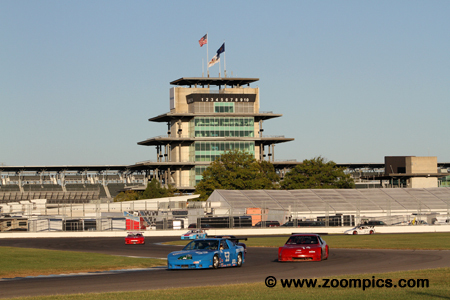 The 54th running of the event was held at the Indianapolis Motor Speedway. This venue attracted a record number of members. There was a total of 969-entries at the 2017 Runoffs � a new record. 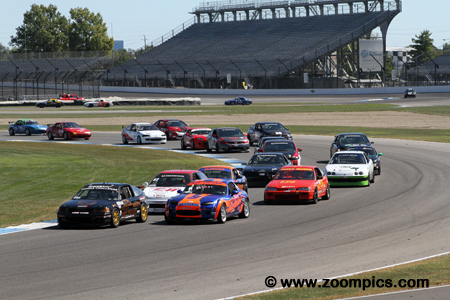 The Spec Racer Ford Gen 3 class boasted the greatest number of competitors with 101-drivers going for the gold. 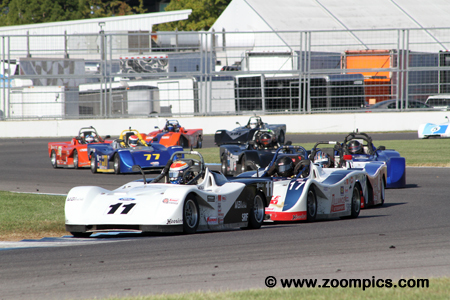 The open wheel class with the best representation was Formula Vee with 39-entries. The event was held during the last week of September and teams and fans enjoyed sunny conditions with warm temperatures. In August of 2016 half a dozen SCCA Club members tested different configurations to determine the best layout for the 2017 Runoffs. In the end, the decision was made to use the fifteen-turn 2.592-mile layout and run in a clockwise direction. Each race would be limited to seven-two starters that would compete for nineteen laps or forty-minutes, whichever came first, to decide the twenty-eight National Champions. Bryon Long put his Ford Mustang on the American Sedan Tire Rack pole. Long held the lead for the entire nineteen-laps and scored his first National Championship. It sounds effortless but he had to hold off a late race charge from thirteen-time National Champion, John Heinricy. Heinricy battled for much of the race with Drew Cattell and once by Cattell, Heinricy closed the gap to Long and finished second by just 0.359-seconds. The 2016 B-Spec champion, David Daughtery, earned his title driving a Honda Fit but for the new season, he switched to a Mini Cooper. The change of brands didn�t appear to affect his performance as Daughtery put the Carbotech/Hoosier Mini on the pole. He beat the field to the first corner and never looked back - winning by a margin of 12.889-seconds. This was Daughtery�s tenth National Championship. The 2017 Runoffs were redemption for Kip Van Steenburg. Van Steenburg was leading the 2015 E Production race at Daytona when the brakes failed on the last lap. He was not going to be denied this year. Van Steenburg started third but on the first lap of racing led the field into corner one. The battling for position behind him allowed Van Steenburg to open a comfortable gap. He won his first National title by 2.441-seconds. Tire Rack pole winner, Wiley Clinton McMahan spun on the out lap. McMahan rejoined the field a number of rows behind his original starting position. By lap two, he was out front and won the title by 11.196-seconds. However, SCCA rules require a competitor to start at the back of the field if they lose their grid position on the pace lap. McMahan was penalized 10-seconds which did not affect the final results. The 2003 GT4 National Champion, Keith Grant, entered the Formula Atlantic category in 2004. Despite a number of podium finishes Grant has never won a Formula Atlantic title but that was about to change. He qualified second at the 2017 Runoffs and followed the pole-sitter, Sedat Yelkin until Yelkin damaged his car lapping a back-marker. Grant passed him on the seventh lap and went on to win his first Atlantic championship. More entries than starting positions meant a �Last Chance Qualifying Race� was necessary for some Spec Miata and Spec Racer Ford Gen3 drivers. Late Thursday afternoon forty-one Spec Racer Ford Gen3 drivers attempted to qualify for the National Championship contest � only the top twelve finishers would advance. Three entrants did not make it beyond the second corner and another seven were not classified. 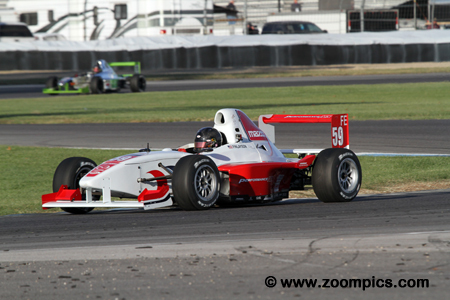 Michael Greene was one of the forty-one drivers in the Spec Racer Ford Gen3 �Last Chance Qualifying Race�. 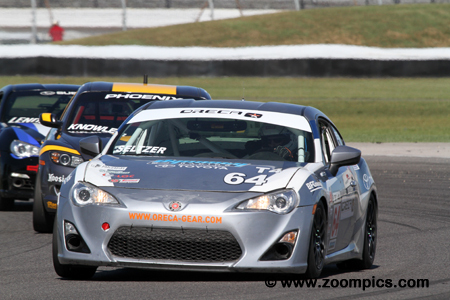 Greene was gridded fourth but moved to first at the races mid-point and took the victory. In the National Championship event, he started sixty-first and was forty-fourth at the checkered flag. Always a contender, John Black has four National Championships to his credit � two in GT3, one in Spec Racer Ford and his most recent coming in Spec Racer Ford Gen3 at last year�s Runoff. 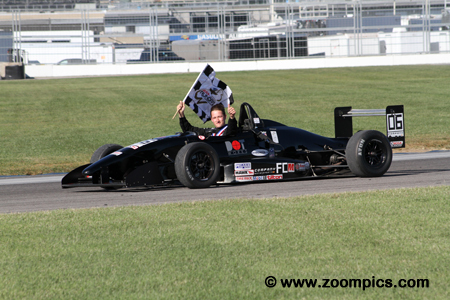 At Indianapolis, Black qualified his Spec Racer Ford Gen 3 on the pole. He led a total of five-laps and diced with Mike Miserendino and eventual winner, Tray Ayres. At the end of nineteen-laps, Black grabbed the final spot on the podium. Spec Racer Ford Gen3 driver Tray Ayres qualified second. During the race, Ayres had a terrific battle with the pole-sitter, John Black and third place starter, Mike Miserendino. He led a total of fourteen laps taking first place for the final time on the ninth circuit. Despite a late race charge from Miserendino, Ayres held on to win his first National Championship by a margin of 1.872-seconds. 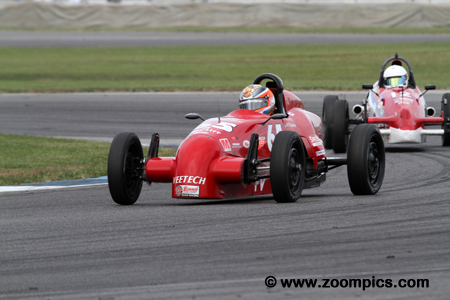 There was plenty of excitement in the Formula Mazda race. Starting on the pole was Jarret Voorhies but oil in the corner one on the first lap caused him to spin and drop to the rear of the field. This allowed Mike Anderson to take the lead but he was passed on lap-6 by Mel Kemper. 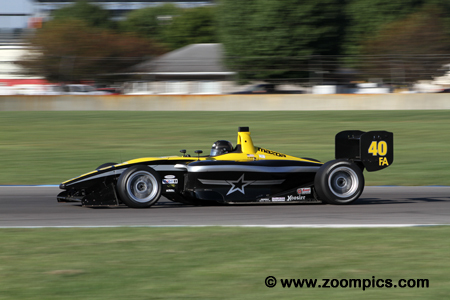 Kemper driving the Mazda/Goodyear sponsored Star Formula Mazda took the lead. Despite challenges from Voorhies and Anderson, he won. 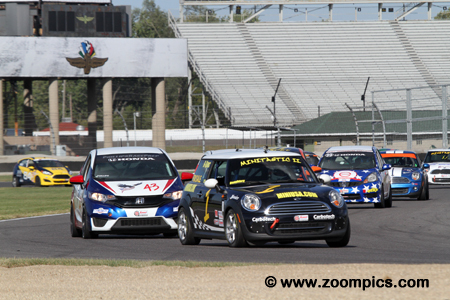 Race seven of the 2017 Runoffs and forty-one F Production competitors enter the Indianapolis Motor Speedway�s last turn in anticipation of receiving the Starter�s green flag. On the Tire Rack pole is the No. 7 Mazda Miata of Eric Prill. Sharing the front row with Prill is another Miata driven by Sam Henry. 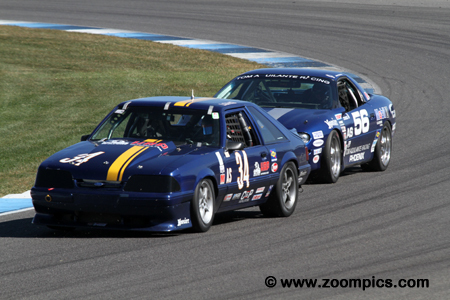 Row two is occupied by two drivers with National Championships on their resume � Joe Huffaker and Brian Linn. Often a contender for the F Production National title, Eric Prill had never stood on the top of the podium. That was about to change in his sixteenth attempt. Prill captured the pole and led all eighteen laps, in what was to become a timed event, to win his first National Championship by a margin of 2.332-seconds. It wasn�t an easy win for Prill as there were two restarts and he had to hold off a challenge from Joe Huffaker. The first Touring 4 carr across the finish line was the Toyota 86 of the 2016 class champion, Oscar Jackson. The pole-sitter, Jackson had contact with the race leader, Chi Ho, on the first lap. As a result, he was penalized three positions by the Chief Steward. This decision moved, Darren Seltzer driver of the No. 64 Scion FR-S from second to first. This was Seltzer�s first National Championship. 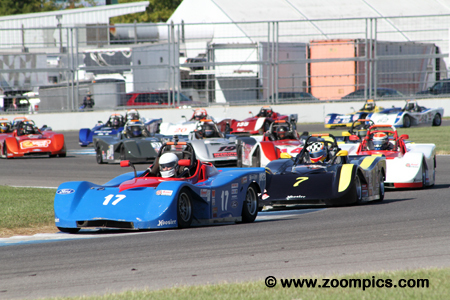 As usual, the Formula Vee group was one of the larger grids at the Runoffs. Michael Varacins proved to be the �class of the field� � the five-time National Champion was the fastest driver in the four qualifying sessions. 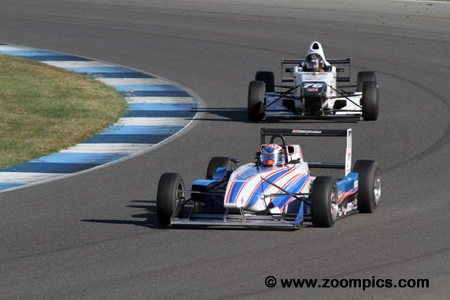 During the race, Varacins the Protoform P2 of Andrew Whitson pulled away from the pack. Unfortunately, Whitson�s car developed a problem and Varacins won his sixth title by a comfortable margin. 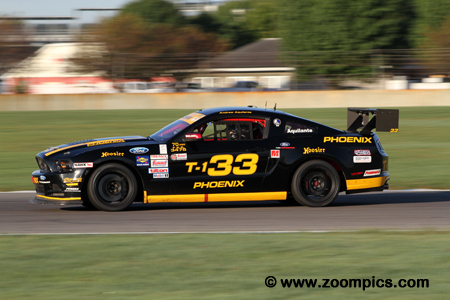 David Pintaric visited the Indianapolis Motor Speedway in June for the Trans-Am event. This opportunity gave him an edge over much of the field. 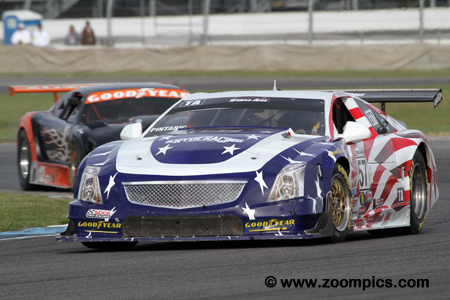 Using his experience, Pintaric put the Kryderacing/Ave Racing sponsored Cadillac CTS-V on the Tire Rack pole. At the start, he took the lead and turned conservative lap times to preserve the tires. Pintaric�s strategy paid � he led flag-to-flag for the GT1 title. 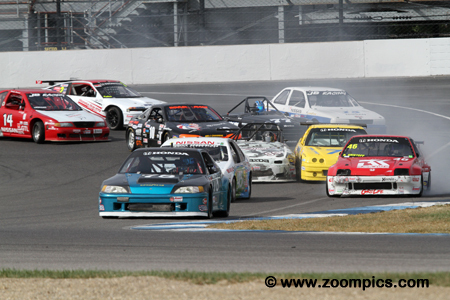 The pace lap and a field of fifty-two Super Touring Lite competitors prepare to receive the Starter�s green flag. 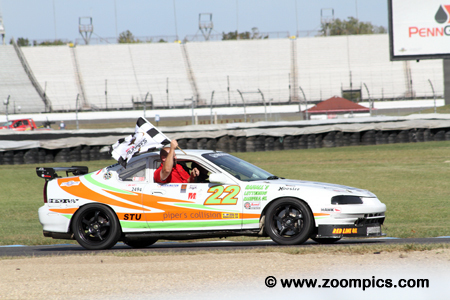 On the pole is the Honda CRX Si of Adam Roberts. 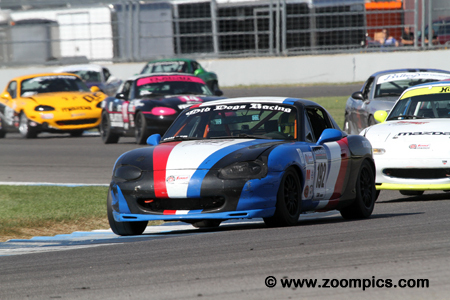 Next to Roberts is Danny Steyn driving a Mazda MX-5. A flat tire on Steyn�s Mazda prevented him from completing the first lap. 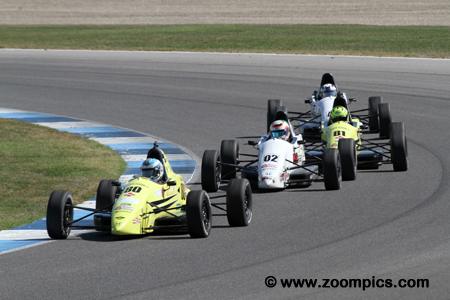 In the second row is last year�s runner-up, Eric Kutil and Honda racer, Garrett Dunn. 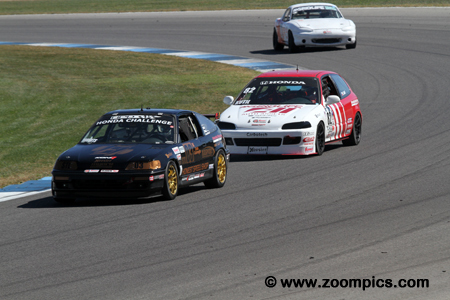 The opening laps of the Super Touring Lite contest was a battle between � pole-sitter, Adam Roberts and fellow Honda drivers, Eric Kutil and Garrett Dunn. Mid-race, Roberts and Kutil pulled away from Dunn. A pass on lap-4 allowed Kutil to move into first place. But lapped traffic provided to be his undoing and Roberts retook the lead for the final time on lap-14. Kutil was the �bridesmaid� for the second year in a row. Pole-sitter, Gary Hickman led the first four-laps of the Formula 1000 contest before being passed second fastest qualifier, Alex Mayer. Mayer led last year�s event at Mid-Ohio but retired after making a mistake and damaging his JDR Suzuki. 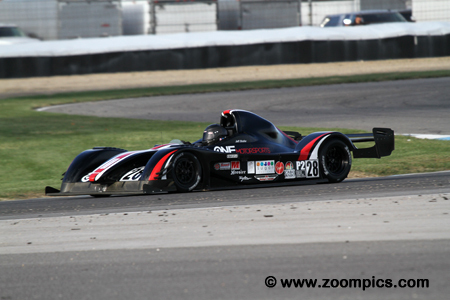 The two continued to trade first place until lap-15 of 19 when there was a major incident involving a Prototype 1 car. Mayer was in first place when the contest ended and was awarded the title. Andrew Aquilante earned his second National Championship of the day on Friday afternoon - this was his eighth Runoffs title. Aquilante dominated qualifying; his fastest lap was 2.514�seconds quicker than the second place starter, Taz Harvey. 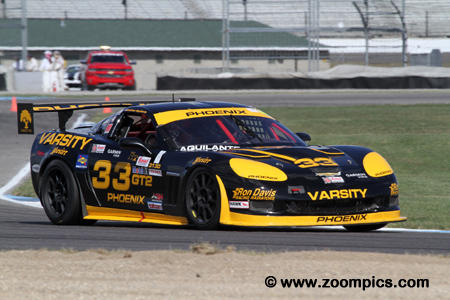 At the drop of the green flag, Aquilante jumped into the lead � taking the Phoenix Racing/Hoosier Tires/Hawk Brake/Varsity Chevrolet Corvette to a comfortable victory in GT2. The popularity of the Spec Miata category resulted in an oversubscribed entry list for the 2017 Runoffs. As the grid was limited to seventy-two starters, there was a �Last Chance Qualifying Race� late Thursday afternoon. Twenty-five drivers started this race with the top-twelve competitors advancing to the National Championship round. At the conclusion of eight laps of racing, the victory went to Jesse Singer. 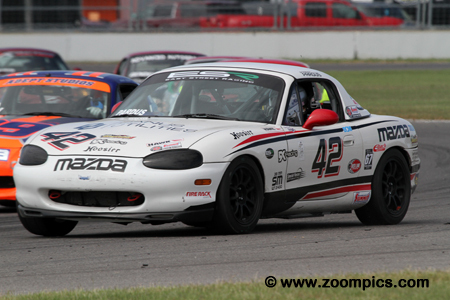 The �Last Chance Qualifying Race� for Spec Miatas was won place Jesse Singer in the Hilton Todd Investments sponsored Mazda. The Florida resident qualified seventh in the twenty-five car field and was first at the conclusion of eight-laps. In the National Championship event, Singer started sixty-first and finished fortieth. Spec Miata and SRF Gen3 had the largest number of starters at the 2017 Runoffs. 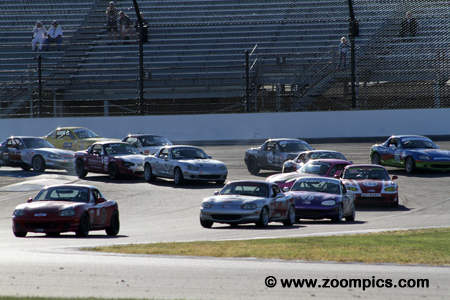 Seventy-two entrants meant that there would be some outstanding racing and the Spec Miata group delivered. Four different drivers took turns leading the nineteen-lap race � the pole-sitter, Chris Haldeman, Danny Steyn � later disqualified, Selin Rollan and Preston Pardus. But it was Pardus who led the most important lap and took the title. Touring 1 was first race of the 2017 Runoffs. A perennial favorite, Andrew Aquilante captured the pole position in the Phoenix Racing/Hoosier Tires/Hawk Brakes sponsored Ford Mustang. At the start of the race, Aquilante was challenged by last year�s champion, Ross Murray - but he was able to lead the first lap and drew away from the field. Aquilante was the first to the checkered flag - winning by a comfortable margin. Mark Weber started racing in 1974 and at some point, he set a goal for himself to compete in fifty Runoff events. In 2012, Weber reached that milestone and the same weekend also marked his 500th race. 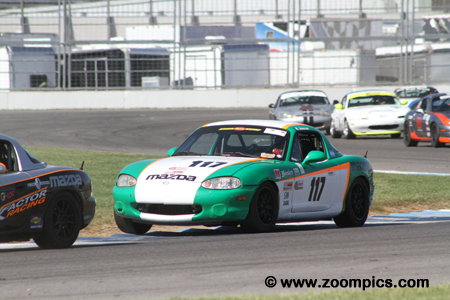 At the 2017 Runoffs, Weber entered two classes � E and F Production � in his Mazda Miata. This brings his total Runoffs starts to fifty-seven which is going to be a difficult record to surpass. 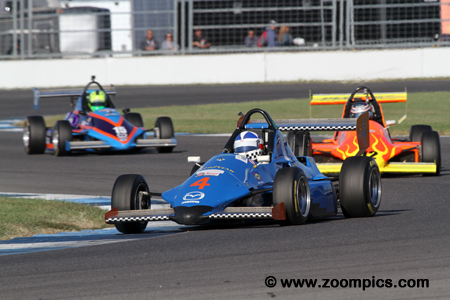 Austin McCusker, driving a Van Diemen RF02, started on the Formula Continental pole but was passed by the second fastest qualifier, Tim Minor on the first lap. Oil on the track at the beginning of the race caught many of the contenders off guard. A restart after the full-course yellow for the oil clean-up allowed McCusker to slip by Minor for the lead. Although he was challenged, McCusker held on for the title. It is difficult to bet against GT3 competitor, Colin Jackson. The Canadian has three National Championships in three attempts. Before the event, Jackson and his team did extensive testing which was confirmed by his performance. His turned the fastest lap in the qualifying sessions and won the pole by 2.752-seconds. With this kind of speed, Jackson went unchallenged in the race and scored his fourth National title. Defending Prototype 2 National Champion, Jeff Shafer came to Indianapolis prepared to win his second consecutive title. 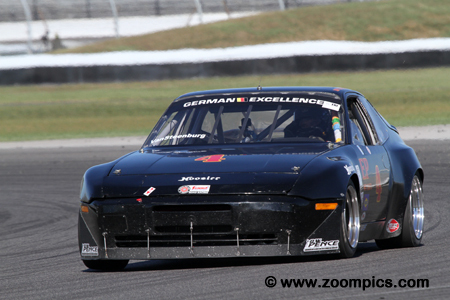 Shafer dominated qualifying and secured the Tire Rack pole position by a margin of 3.208-seconds. At the drop of the green, he was gone and never looked back � at the checkered flag, Shafer�s One Motorsports Stohr WF1 powered-Suzuki was one lap clear of the second place finisher, Tim Day, Jr. 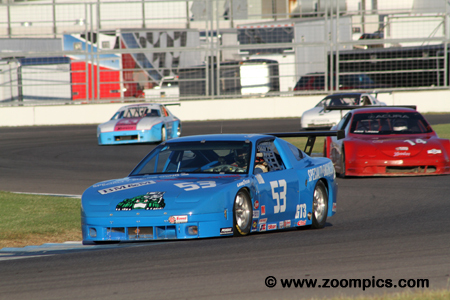 The first seven laps of the Super Touring Under class belonged to the pole-sitter, Rob Huffmaster. Unfortunately, he retired when his Honda S2000 suffered a mechanical problem. The lead was inherited by the Honda Prelude of the third fastest qualifier, Max Gee. Gee whose Honda had failed on the first lap last year�s race turned in a flawless performance. He won his first National Championship by a margin of 5.093-seconds. A number of Indy Car owners have competed at the Runoffs - Roger Penske, Bobby Rahal, Michael Andretti, Chip Ganassi and Jimmy Vassar. Ricardo Juncos has fielded successful drivers in the Mazda Road to Indy series - Pro Mazda and Indy Light and this year he entered two cars in the Indy 500. 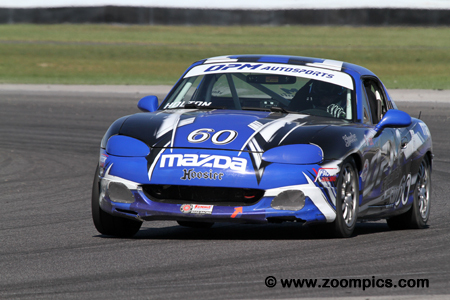 At the 2017 Runoffs, Juncos competed in the Spec Miata category � qualifying forty-second and finishing thirty-six. It was an 8.339-second margin of victory for Jason Isley in the H Product event. Isley has many podium finishes but never had the pleasure of standing on the top step of the rostrum. 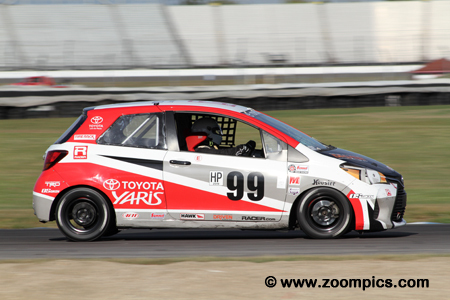 He started on the Tire Rack pole in the RACER.com / Hoosier / TRD sponsored Toyota Yaris. Leading all nineteen laps � unchallenged � he won his first National Championship by a comfortable margin. 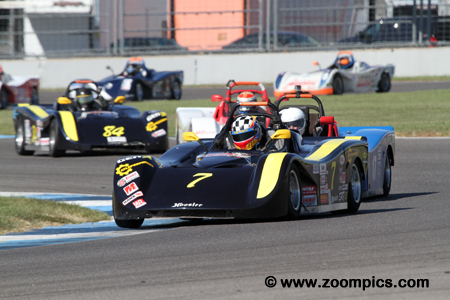 Among active drivers in the Spec Racer Ford category, Mike Miserendino has the most titles � four (Warren Stilwell who no longer participates has seven championships in the class). Miserendino qualified third but during the race, he found himself in a three-way drafting battle for the lead with last year�s champion, Todd Harris and Scott Rettich. He led fifteen circuits and was in first place on most crucial lap. 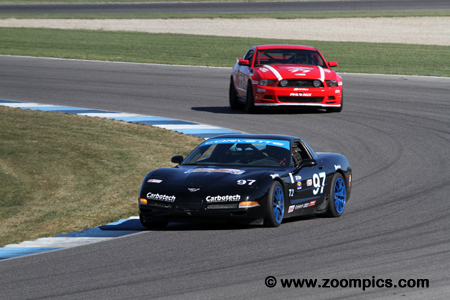 Last year�s Spec Racer Ford National Champion, Todd Harris qualified on the class pole. During the race, Harris along with Mike Miserendino and Scott Rettich lined-up and drafted each other which allowed the trio to pull away from the field. Harris was in the lead on the penultimate lap but could not keep Miserendino behind him and captured the runner-up position just 0.194-seconds behind the winner. Touring 2 pole-sitter, John Buttermore lost the lead to the second and third fastest qualifiers, Kurt Rezzetano and Preston Calvert on the opening lap. An aggressive move on the second circuit allowed Buttermore regain first place. He began to put some distance on the rest of the field and despite a full course caution period, Buttermore was able to retain the lead. The two time Touring 1 champ earned his first T2 title. 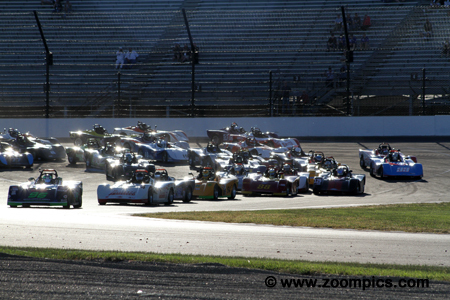 A large competitive field of Formula Enterprise drivers was entered at the Indianapolis Motor Speedway. Quickest of them all was Elliot Finlayson � topping the time sheets in the four qualifying sessions. Finlayson driving the Performance AFX Motorsports Mazda FE led all nineteen laps to earn his first National Championship by a margin of 12.890-seconds. It is a very crowded corner one at Indianapolis Motor Speedway as twenty-four GT-Lite competitors start their first race lap. Leading the way to corner two is the Tire Rack pole-sitter, Christopher Bovis driving a Honda CRX. 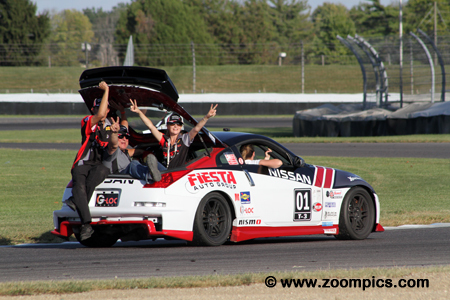 The Nissan of the third-place starter, Peter Zekert has already slotted into second place. Ryan Kristoff who shared the front row with Bovis drops back to the third position. The 2017 GT-Lite grid included a field of drivers with twenty-one National titles to their credit. 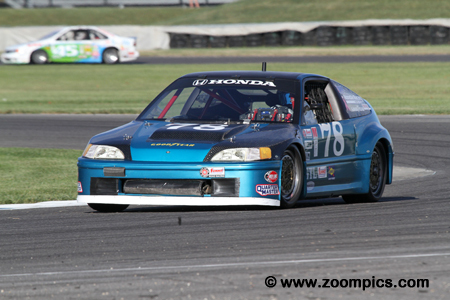 Leading the way was Christopher Bovis racing the Goodyear Tires/JDM Motorsports Honda CRX. Bovis had won two National Championships. He grabbed the Tire Rack pole on the last day of qualifying and at the start of the race, Bovis was the first competitor through corner one. Unchallenged, Bovis won his third title. Although considered the Olympics for amateur sport car racers the Runoffs also attracts its fair share of drivers who have achieved success at the professional level. On such driver is, Paul Holton. Holton has enjoyed success in the Continental Tire Sports Car Challenge and the Pirelli World Challenge Series. He captured this season�s World Challenge Touring Car title. 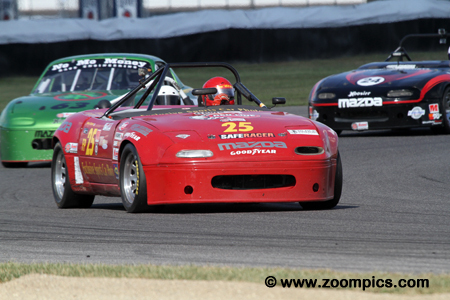 At the 2017 Runoffs, Holton finished eleventh in Spec Miata. The 2017 Touring 3 National Champion, Derek Kulach and his crew enjoy the victory lap. Kulach the defending Touring 3 title holder qualified third. 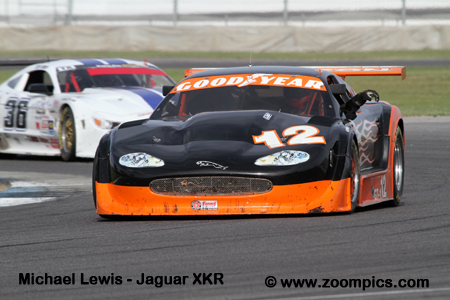 An incident at the start, between the front row starters, Rob Hines and Todd Lamb allowed Kulach to grab second. By lap-2, he had passed the race leader, Charles Hurley. With second through fourth battling for position, Kulach was able to pull away and score his second title. 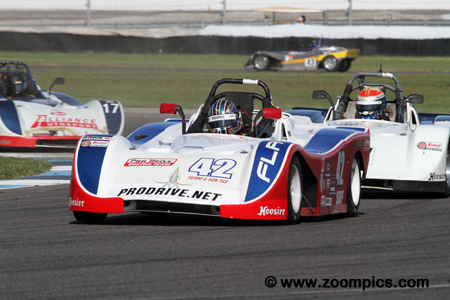 Three different drivers led the Formula F contest making it one of the most exciting races at the Runoffs. 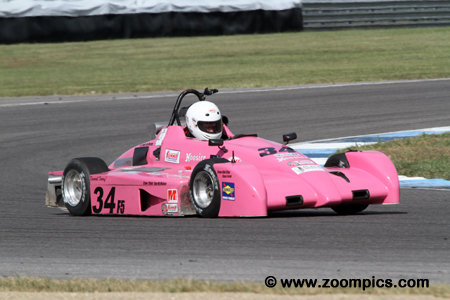 Pole-sitter, Zack Holden driving the K Hill Motorsports prepared Mygale led a total of nine laps and finished second. 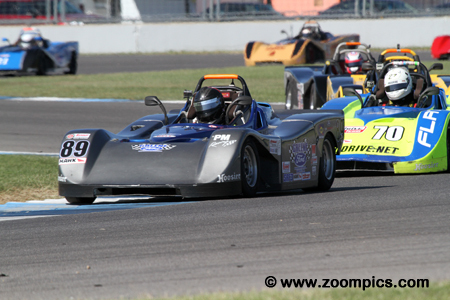 Jonathon Kotyk also in a Mygale was in first place on laps seven and twelve. But it was Matthew Cowley in the Team Pelfrey/Gap Guard Mygale who led the most important lap and scored his first National title.